two different orientations. The S (yellow) does not. Since we were discussing thermodynamics in biological systems the other day, here's a neat example from Angewandte Chemie of a system where thermodynamics reveals something surprising. 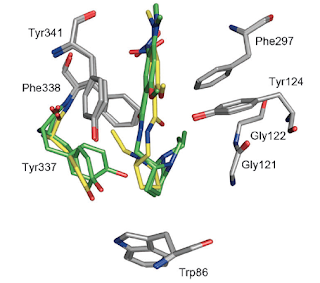 The authors from Umeå University in Sweden were looking at two enantiomers of a ligand binding acetylcholinesterase. It's a robust, well-studied system and you don't really expect anything unexpected. Except that it does do something unexpected. The first surprise was that both enantiomers bound with the same binding affinity. This is an observation that violates a central general tenet of biochemistry, namely that ligands and receptors are both chiral and therefore enantiomeric ligands will bind differently. The second surprise was that when they dissected the similar free energy of binding into entropic and enthalpic components, they found that the S enantiomer had a much more unfavorable entropy (1.5 e.u) than the R (8.5 e.u). Since the free energies were the same, this meant that there was enthalpy-entropy compensation, which meant in turn that the S enantiomer must have the more favorable enthalpy. To investigate the origins of these differences, the two enantiomers were crystallized with the protein. Observation of the binding site indicated something interesting; the R enantiomer bound in a way that allowed a critical tyrosine residue (Tyr337) to adopt two different orientations. However, the S enantiomer shoved an ethyl group next to the tyrosine, essentially precluding this movement. Greater conformational flexibility for the tyrosine translated to greater disorder, hence the more favorable entropy for the R. What about enthalpy? Here it turns out that the S enantiomer, while sacrificing entropic freedom for the tyrosine, compensates by making stronger interactions with it. This was analyzed by quantum chemical calculations on a "reduced" version of the protein. Interestingly, the interactions are not "normal", respectable hydrogen bonds but "unnatural" C-H---O hydrogen bonds. For the R enantiomer, even these relatively weak interactions were enough to confer an enthalpic advantage that offset the entropic disadvantage. This is why chemistry in general and biochemistry in particular are endlessly interesting; conventional wisdom is always being challenged even in well-studied systems, weak can be important, every example is unique and best of all, surprises lurk around almost every corner. As Arthur Kornberg put it, "I never met a dull enzyme". Nice example. However, the entropy difference is much larger than R*ln(2) so it's a bit more complicated than conformational entropy. Perhaps the "R" complex has a higher vibrational entropy as well? Interesting. Would this be something that could be quantified through quantum chemical calculations or normal mode analysis? Yes, that should be possible. Computing accurate vibrational entropies are always a bit tricky since they depend most strongly on the low-frequency modes, which are most anharmonic. On the other hand these two systems are very similar, so we should get a lot of cancellation of error. Who's afraid of Big Bad Thermodynamics? Book review: Benoit Mandelbrot's "The Fractalist"